Hello bloggers, how was your Christmas? All good I hope. Mummabstylish was thoroughly spoilt with some fabulous gifts, wonderful food and plenty of fizz! Christmas Eve was spent preparing Baked Red Cabbage, Chicken Liver Pate and Profiteroles, love a bit of homemade delights - they taste so much nicer than packet bought, but do take much longer to prepare. Had a slight malfunction when doubling the ingredients for the profiteroles, I mean how difficult is it? Obviously quite hard because I had two attempts after forgetting to double the eggs! The result was a cross between mini Yorkshire Puddings and biscuits, looked like a stone! Result birds 1 - me 0. Second attempt worked well, and I left them covered in cling film until filling them with cream and topping with chocolate for Boxing Days' Dessert. Delicious I must say. A whirl wind of present unwrapping, eating, laughing and possibly a little drinking ensued over the next couple of days, and I have to add the highlight of my Christmas is the Gravy! Yes that may sound a little strange to some, but the gravy my husband makes is... well ... quite frankly divine! He boils the giblets along with carrot, onion, celery, parsley and salt/pepper, which is then added to the turkey pan juices, if you've had this before you'll know what I mean, but if not it's most definitely worth a try. So after a few days chilling it's soon going to be time to don my glad rags for NYE celebrations. Then the questions arises - yes you know it - what to wear? I've got a choice of two outfits, and I'd love some help in deciding what one to wear! The dress in top position so far is my bargain from the Marks and Spencer outlet store. Previously worn here this is a black and gold stretch lace dress. Fitting me perfectly from top to bottom, and comfortable with it. A great length, finishing below the knee, scoop neckline - room for a cute necklace I think. 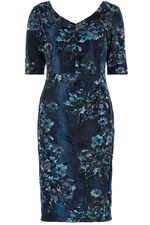 Runner up for now is this blue Flocked Floral stretch dress with a lovely ruched effect across the tummy area, I feel this may accentuate my tummy and not hold it in, but what do you think? Again I love the length of this dress and it also has great sleeves, 3/4 are perfect to cover my arms, but hopefully I wont boil! I think there may be a little dancing on NYE so heat is a major concern, I don't want to get too hot, nothing worse than a sweaty, flushed face to ruin your make-up. I'd love to hear what your choice of dress would be, please leave a comment whether it's black or blue? 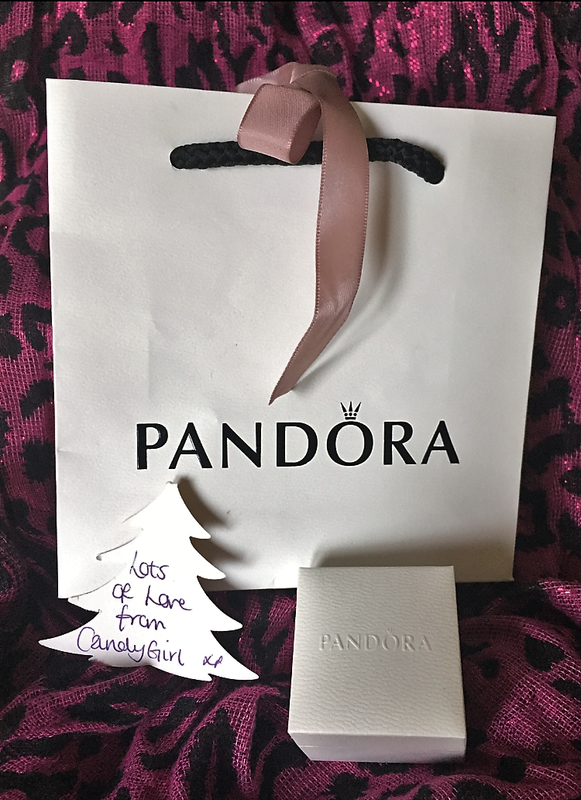 One of my extra special presents was this beautiful Pandora Charm. ....you might remember I had to say goodbye to my beloved Candy Girl back in July (see my tribute to her here) My little Jack Russell doggie had been in my life since we got her back in 2001, as most of you will know a dog IS a member of the family, so when they go they ARE missed every day. Hubby bought this stunning little charm for my Pandora bracelet, I love the little paw print on one side, with I love my pet on the other. A meaningful, thoughtful gift that is very much loved and cherished as was my Candy. Well that's enough of me today, hope you'd had a wonderful Christmas and have an even better New Year.....I'll catch up with you on the flip side! For me, it's definitely the black lace, I just loved you in it when you first showcased it. The blue is lovely but I can see you dancing in the lace! Sorry about your doggie, your hubby was most thoughtful with that gift. Thanks for popping in to see me in 2016, your visits were much-appreciated X. Have a fab night tonight and a happy and healthy 2017. I assume you wore the lace dress. It was my favourite too.